Spacious storage: Carry your yoga mat, yoga block, jacket, towel, keys, tablet, water bottle, umbrella, cards and phone easily to your yoga class or different outside activities. 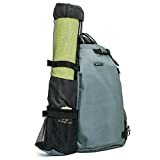 Multiple compartment: Includes a side mesh yoga mat holder with adjustable strap, a side mesh pocket, front zippered closure pocket, main pocket for larger personal items, and the back zippered pocket for thin, flat items such as tablets. Durable: Featuring a durable construction, this sturdy bag is water-resistant and can withstand the wear and tear of the daily commute. Relaxed: The padded adjustable strap makes carrying even the heaviest loads less of a burden on your shoulders. Multi-purpose: Use this bag for hot yoga classes, Pilates, gym, workout, fitness training, office, school, college, university, sports, hiking, cycling, biking, exercise, walking and travel. Evecase Yoga Crossbody Sling Bag Backpack is designed to let you express your style without decrease storage space and functionality. This backpack let you carry everything needed to do sports or yoga. The side yoga mat holder is a large mesh pocket with adjustable side straps to keep the mat firmly in place, and the other side mesh pocket features to carry umbrella or water bottle. The large inner compartment is ideal to put towels, yoga blocks, jackets, or other personal accessories. A snap closure pocket is perfect for wallets, keys, or small items, and the back zip pocket is perfect for tablet. The padded adjustable strap makes carrying even the heaviest loads less of a burden on your shoulders. It is perfect for keeping your hands-free in various situation. Feel relaxed with the Evecase Yoga Backpack for versatility and unique lifestyle. Yoga mat and accessories are not included.